Most probably they are merely Eastern Europe (for a Cold War definition of Eastern Europe) and therefore prejudiced against. Anyway my impression is that the Swiss look down on everyone else. (I wouldn't claim that Serbians wouldn't be prejudiced against in France before someone asks). Because tax payers are so cheap. I think we knew that a few months ago. Alas this seems very real. And I can see more conventional democracies doing the same, because who cares about people who buy too much beer or play video games? Give me what I want or I will hold my breath until something happens. 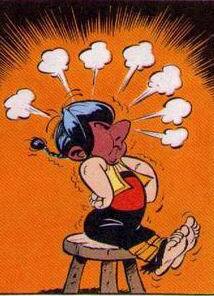 (Someone linked that twitter nonsense at me and I thought there was an Asterix joke to be made). I understand they also don't marry much; Korean women would have to work for so many hours a day, plus do everything at home. Death Proof was (I think) less violent than other movies of his, and it was a commercial failure. Also I like the idea that strongish authors do whatever they want, instead of the same old thing that is dictated by big companies. Also when doing an ad hominem you are usually attacking *someone*, not making a generic statement about hypothetical people. My point was, mass is more significant than length. And size is a super vague word. Eebster the Great wrote: I hear CDs are gonna replace casettes soon. That was done for some of the coolest languages; but French is still learned using cassettes. The US wanting out of world economy is quite a bold move; I wonder how many seasons will keep us entertained. In other words, nobody is ever rehabilitated. This is the funniest part about Eurovision: no country wants to host it. Hence all the trolls not really trying to win.